The redesigned SpeechMike Classic now includes an integrated barcode scanner that swiftly retrieves patient or client identification information simply by scanning a barcode. The scanned information is automatically attached to the patient or client dictation, streamlining the documentation process. By automatically scanning in patient or client data, all identifying information is entered accurately, increasing security and cost saving potential. 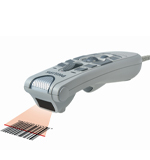 The barcode scanner has a new, adjustable scanner, allowing it to be set to two scanning positions. The SpeechMike Barcode marries all of the benefits of the versatile new SpeechMike with the functionality of a barcode scanner.